Cuddle Up Appeal Here at Martlets we want people to feel as comfortable as possible when they stay with us. It’s important that our rooms feel relaxed and snug; a restful home from home. 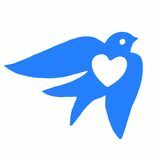 Welcome It’s another very full edition of Martlets Mail with news, features and stories about our work and how you can get involved. Check out our Events Calendar on pages 6 and 7 for a complete round-up of our fundraising fun this summer. Hove Carnival is just around the corner, on May Bank Holiday Monday, so mark it in your diary or perhaps sign up for a pitch. We’ve also got colourful Kapow back again in September; if you enjoyed last year’s super-heroic bounciness, then take a look at page 3. Meet our Pets as Therapy volunteer, Robina, and her King Charles Spaniels Topsy and Jacob on page 9 and hear about why Martlets is so important to Paula on page 8. Tireless volunteer, Val, talks about her unexpected hospice lottery win and how she plans to spend her winnings on page 5. On page 10 we’ve an update on our Earthworks project and on page 11 there’s our Will Writing Fortnight special feature. I hope you enjoy the latest edition of our magazine and, on behalf of everyone at Martlets, I’d like to thank you for all your fantastic support. Our patients have told us that it’s the small things that can make a big difference such as comfy soft furnishings, a homely colour-scheme, cupboards to hang clothes in or even having a spare plug socket near the bed to charge a mobile phone. We would like to upgrade all our Inpatient Unit rooms, to modernise their décor and the facilities that we offer because we think it could make a world of difference to our patients and their families. So, we will soon be launching a £25,000 fundraising appeal - Cuddle Up Appeal - that will help us to transform the rooms whilst also maintaining the practicalities of care such as infection control. Keep an eye on our website and social media for further updates about the campaign and how you can get involved. Goodbye to our Snails Our colourful Snails brightened up Brighton and brought happiness to Hove throughout the autumn, so it was sad to have to finally say goodbye to them when they went under the hammer at auction in December. Thank you to everyone who made the Snailway the amazing success that it was, raising a fantastic £300,000 for the hospice. We hope you will all continue to #BeMoreSnail! Here’s a small window on erful Snailspace and the wond people who supported us: r learner 57 schools took part in ou , raised far programme and have, so a whopping £42,000. m of Our ever-enthusiastic tea e over gav rs ste volunteer Route Ma g pin hel e 1,700 hours of their tim ing ect dir people with Snailfies and them around the route. en 80,000 trail maps were giv app out and 6,000 Snailspace . de ma re we downloads ere is a The Snail, To Everything Th sum of t Season sold for the highes £12,800 at auction. lway At 94 years young, Jack Ga raised He r. ise was our oldest fundra ilway Sna £1,200 by completing the in his mobility scooter. It has to be KAPOW!! Our superhero-themed KAPOW race is back and promises to be bigger and bouncier than ever! We’re looking for stallholders to sign up for our Hove Park Carnival on Spring Bank Holiday Monday – 27th May. This popular family event always attracts crowds of people and places for stallholders sell out fast! We were delighted to give a big warm welcome to our colleagues from the Community Palliative Care Service (CPCS) in September, when they officially joined Martlets from the Sussex Community NHS Foundation Trust. The CPCS is a team of thirty medical consultants, speciality doctors, clinical nurse specialists, community nurses, occupational therapists, administrators and volunteers who provide a specialist palliative care service within the local community. They are absolutely vital to our work and have been based at the hospice, working in partnership with us, since the building opened in 1997.
for the day; so other support organisations are welcome to get in touch if they would like to have a stall at the event. 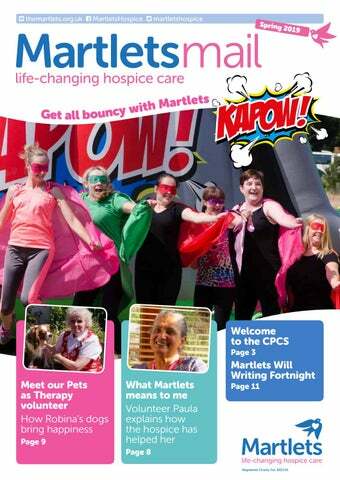 For further information please contact jane.cato@martlets.org.uk or telephone on 01273 273448.
recently recognised Martlets Care as being the ‘Best Care Employer’ in the South East. They also highlighted that the agency has one of the best care staff retention levels in the UK homecare sector. If you are seeking home care for yourself, a friend or family member, then please contact soosan.porter@martletscare. co.uk or telephone on 01273 829943. If you would like to know more about joining the Martlets Care team as a carer in the community please visit www.martletscare. co.uk/work-with-us or telephone on 01273 829943. Do something good for your local community Put something back into your local community by giving just a few hours of your spare time each week to Martlets. Volunteers are urgently needed to help at our nine charity shops and Hove Warehouse and Distribution Centre. You’ll meet lots of new and interesting people, it’s great fun plus you’ll get a fantastic feeling from doing something worthwhile for the city and its people. A volunteer who has been tirelessly working for Martlets for more than twenty years has won our lottery jackpot of £1,500. Tireless volunteer wins our lottery Val Persaud has worked in several of our charity shops and has, for the last sixteen years, been helping behind the scenes in our warehouse with the important task of sorting out clothes that have been donated. She said, “I love volunteering, it’s something I’ve always done because it keeps me busy and active. I’m here three times a week and it takes me an hour to get here, on two different buses, so I must really enjoy it! “I’ve been playing the hospice’s lottery for a very long time, so I really got a shock when they rang and told me that I’d won. I thought someone was having a joke to start with, it took me a while to come to terms with it. It was only when I received the cheque that it became real. “I hadn’t been doing the lottery with the intention of winning, I played it because Martlets is such a good cause; I really didn’t expect to get anything back. How to play... You can play our lottery for as little as £2 a week with a chance of winning the top prize of £1,500. The winners’ numbers are drawn by computer each Friday and are published the following Monday in the Argus and on our website. Georgia Ellick from our People Services Team said, “Everyone has a different reason for volunteering for Martlets, whether that’s a personal connection or they just want to help a local charity. We have people of all ages from all kinds of backgrounds; each bringing their individual experience, talents and enthusiasm. “What is common to everyone is that they want to do something good for their local community; to feel like they’ve made a difference to someone’s well-being. That’s something that you really sense with every hour of time that you donate to Martlets – it’s really important to us, our patients and their families.” To find out more about volunteering for us please contact peopleservices@martlets.org.uk or call 01273 718788. Sign up online at www.themartlets.org.uk/ join-our-lottery or contact Sheila Green on 01273 747455 for more details. Please note: to play our lottery you MUST be at least 16 years of age and resident in England, Scotland or Wales. May Brighton Run2Music Madeira Drive, Brighton Saturday 11 May A sponsored fancy dress fun run for all ages where you can groove to the music as you tackle one of three distances. August Prudential Ride London – Surrey 100 Sunday 4 August Join #TeamMartlets for this 100 mile traffic-free cycle ride that starts at Queen Elizabeth Olympic Park in East London and takes you through Surrey and back again along the route made famous during the London 2012 Olympic Games; finishing triumphantly on The Mall. Info: Entry is £100 with a minimum fundraising target of £350. For further details and to book a place please contact the Fundraising Team. What Martlets means to me… Paula Perera has volunteered for Martlets for more than ten years, driving patients to appointments, helping in the hospice café and serving much needed cups of tea on our Inpatient Unit. She has also used our Will Writing Service and has left a bequest to the hospice. Paula explains why it is so important for her to be able to support Martlets. Meet our Pets as Therapy volunteer Retired Infant School Teacher and hospice volunteer Robina Williams brings her gorgeous Cavalier King Charles Spaniels Topsy and Jacob into Martlets to visit the patients as part of the Pets as Therapy (PAT) scheme. It’s a valuable role that she’s done for more than 28 years, since she first began taking her PAT dogs into Coppercliff Hospice, the Martlets’ predecessor. “Topsy and Jacob try to be well behaved,” she says, “they’ve been visiting patients since they were 10 week old puppies, so everyone makes a fuss of them when we arrive. them something else to concentrate on and livens them up a bit. It really is a source of comfort for some people; they like to chat about their own pets and their memories, which really does them good. I simply listen; if we cheer up one person’s day then we’ve helped. There’s nothing like having a good declutter when it gets to spring, but please do remember to pass on any saleable clothing, furniture or homeware to us. Your generous donations help us to raise money to care for our patients and their families. to work, whilst enjoying getting outside in the fresh air. Jane Cato from our Bereavement Team said, “It’s all very relaxed; each morning begins with a cuppa in the allotment shed around the wood burner. Pebble memory walk You are invited to welcome the sunrise and remember loved ones with our early morning Pebble Memory Walk, which takes place on Saturday 29th June. Starting at 6am on Hove Seafront, opposite the Big Beach Café, the walk is open to all and led by our chaplain, Nicholas Roddis. We will begin by choosing a pebble to symbolise the love you hold for those who you will be remembering. There will then be a few moments of quiet reflection before a gentle stroll along the promenade to the Hove Peace Statue. “It’s a very hands-on way for people to come together and to use their skills and energy to complete practical tasks, whilst gaining the benefit of talking to others who are in a similar situation – if that’s what they want to do. “Less than a quarter of those using our hospice bereavement services are men and there’s nowhere else in Brighton & Hove for bereaved men to get together. So, it makes sense to find an alternative way to support those men, since we know we can help them.” To find out more about Earthworks, or to sign-up please contact our Patient and Family Support Administrator on 01273 273400, or email bereavement@martlets.org.uk. shaped tribute on the seashore from everyone’s pebbles; which will finally be returned to the sea as the tide comes in. “Join us at the end of the walk for a tea or coffee before entering into the rest of the day. Martlets Will Writing Fortnight We will be taking bookings from 15 April for our Will Writing Fortnight which runs from 13 to 24 May. Twelve local will writers are giving their time free of charge in exchange for a donation to Martlets. Simply contact one of them to book your appointment. Our Legacies Manager, Gary Moyle said, “This is the perfect opportunity to get that difficult paperwork done whilst also helping an important local cause. “We hope that some people will also think about making a gift in their will to Martlets. One in four of our patients is cared for thanks to gifts in wills. “Getting your will professionally written means that you’ll have peace of mind that your wishes will be followed and that the people or causes you care about are going to be properly looked after. “It’s simple to organise, just choose from one of the twelve local will writers and contact them between 15 April and 10 May to book your appointment. Boost your donation by 25p of Gift Aid for every £1 you donate. Gift Aid Donation Declaration If you are a UK tax payer and wish your donation to be treated as a Gift Aid donation, please complete this section. In order to Gift Aid your donation you must tick the box below I want to Gift Aid my donation of £ and any donations I make in the future or have made in the last 4 years to Martlets Hospice. I am a UK taxpayer and understand that if I pay less Income Tax and/or Capital Gains Tax than the amount of Gift Aid claimed on all my donations in that tax year, it is my responsibility to pay any difference. Signature Date Please return this form to: Martlets Appeal, Fundraising Office, Unit 5, Sussex House Business Park, 270 Old Shoreham Road, Hove BN3 7DX Please notify Martlets Hospice if you: •	Want to cancel this declaration •	Change your name or home address •	No longer pay sufficient tax on your income and/or capital gains •	If you pay Income Tax at a higher or additional rate and want to receive the additional tax relief due to you, you must include all your Gift Aid donations on your Self-Assessment tax return or as HM Revenue & Customs to adjust your tax code. you in the best way We want to keep in touch with keep in touch’ section we can - please fill in the ‘Let’s on the reverse of this form. Regular Donation Form Every donation is important to us, but regular giving is particularly valuable as it provides us with more reliable income, enabling us to plan more effectively. Just fill in and return this form to us. We will continue to send post to you about how your support has made a difference. However, if you would prefer not to hear from us by post, please tick here. We provide life-changing hospice care to people affected by terminal illness in Brighton and Hove and neighbouring areas. Many of our services are funded by our generous supporters through gifts in their wills. We can reach more local people if you choose to remember us in your will. A professionally written will is the best way to protect those you love. Our scheme is an ideal opportunity to make or update your will and support your local hospice. Contact any of the will writers listed above from 15 April to book your appointment, mentioning Martlets Will Writing Fortnight when you book. Appointments take place from 13 to 24 May.